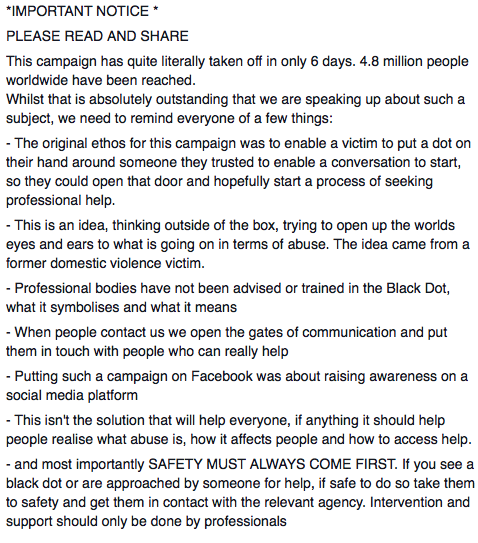 We have been aware of the Black Dot campaign, which asks women living with domestic violence to place a black dot on their hand if they would like others to reach out to them, since it was founded. We have chosen not to speak publicly about the campaign until this weekend as we understood that it was started by a survivor of domestic violence who was trying to support other women living with domestic violence. As a rule, we do not like to publicly disagree with campaigns created by survivors as we understand how difficult it is to speak out. Unfortunately, we do not believe this campaign recognises the risks to women and children. a. Professionals are not trained to recognise the black dot. b. Due to the huge amount of media coverage, perpetrators will recognise the meaning putting women at further risk. a. Someone approaching a woman living with domestic violence who has no training may cause more harm to the woman putting her in further danger. It is simply not appropriate to approach women you have never met to ask if they are living with domestic violence. Many people believe the myths surrounding domestic violence and abuse. Without challenging their misconceptions and prejudices, they are not in a position to adequately support women or find them appropriate services for their needs. b. Unfortunately, many professionals within the NHS, police, social services and education have no formal training on domestic violence and abuse. They may engage in victim blaming or put the woman at further risk. c. Due to the economically and ethically unsafe policy of austerity, specialist services are closing due to lack of funds. There *may* be no where safe for the woman to be taken - homeless services aren't always aware of the importance of safety planning for women. We know of situations where the perpetrator was placed in the same homeless hostel as their victim. Women with children, substance dependencies, mental or physical health concerns, or from Black communities have been disproportionately affected by 'austerity'. There are even fewer resources for these women. d. Women are at most danger of extreme or fatal violence when they are trying to leave the relationship. Women need access to specialist services who can help them with safety planning, which is more than just finding them a safe place to sleep for one night. We must note the fact that the campaign has blocked and deleted tweets to survivors, as well as deleting comments on their Facebook page. We understand the founder will have felt under deluge following the sheer number of women and specialist organisations raising concerns, but we need to be clear when using the media to garner attention for domestic violence to ensure that the message is not misrepresented. We also note the number of aggressive and abusive messages directed at the campaign. Raising concerns or engaging in critical analysis does not require abusive or misogynistic language. This was started by a woman trying to help. She does not deserve the abusive messages she is getting. Raising awareness of domestic violence by placing a dot on your hand is a good technique for starting conversations with people who have never really thought about domestic violence before. Changing this campaign to one starting conversations around domestic violence (and including information and tools to have these conversation) could be a positive approach. Offering to provide support isn't appropriate. We are very clear in our mandate that we are not a support service. We simply do not have the ability to offer adequate support to women despite members of our team being qualified to do so. We have chosen not to do this because we believe it is unethical for an organisation or campaign to offer support when it is not in a position to do so. The Black Dot campaign are not in a position to do so either. Flagging up appropriate services for women is a positive step for them to take but they need to know the history and policies of support services they are suggesting. There are many organisations which advertise as such, but engage in victim blaming or blame the women for their partner's choices. We suggest anyone worried about a friend or relative (or themselves) experiencing domestic violence access this information from Women's Aid. You can also call the National Domestic Abuse helpline run by Woomen's Aid and Refuge at 0808200247 to ask questions on how to reach out to support a friend or relative. We hope that the Black Dot campaign can start a positive discussion around the myths of domestic violence and reaches people who do not realise the damage caused to specialist services by austerity measures.